Yves Landry was born in 1938 in Thetford Mines, Quebec. Being the son of a mine worker, Yves worked in the asbestos mines to finance his University education. Upon graduation, he began working for the Shell Oil Company and then British Petroleum before joining the Chrysler Corporation in 1969 as regional sales manager, based out of Montreal. 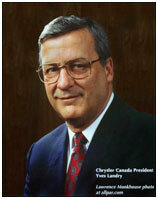 His hard work and dedication led to his rise through the company, culminating in his appointment as president of Chrysler Canada in 1990; he remained in this position until his sudden death in 1998. Mr. Landry was a family man who was very involved in various community causes in the Windsor area. His involvement included work with the United Way, the Cancer Centre’s Dreamweaver campaign, the establishment of a research and development centre at the University of Windsor and an apprenticeship program with St. Clair College. He was named a “Companion of the Order of Canada” in 1995.